On the heels of the successful theatrical and DVD release comes the next big chapter for "The Incredible Hulk" - "Hulk Vs". 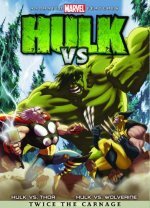 This January, Marvel Animated Features and Lionsgate will release two of the most legendary chapters in Marvel’s comic book history with the eagerly awaited DVD release "Hulk Vs". If Hulk alone weren’t enough, Hulk is now joined by the superheroes of the next 2 Marvel tentpole films – "Wolverine" and "Thor" in this newest addition to the Marvel Animated Features series. Make way for the clash of Marvel’s mightiest heroes, as Bruce Banner’s alter-ego takes on fan favorites Wolverine and Thor in two epic, all new, action-packed animated films -- "Hulk Vs. Wolverine" and "Hulk Vs. Thor". These dark and violent showdowns have been seen in various forms throughout Marvel comic book history, and the rematches have continued to thrill comic fans ever since. Now Marvel and Lionsgate have taken the two epic comic book battles and merged them into two heart pounding tales on one DVD release that stays true to its comic book roots.